"Since its inception, Lapole Electric has proven to be a valuable trade partner in our home building industry. Having known the Lapole's for over ten years, i can always count on their service, responsiveness, and quality workmanship. It has been a pleqasure to work with this family owned and operated company." "I would like to say how pleased I was with Lapole Electric. They provided great service at a great price ! Very professional Electricians and friendly advice. They will receive all of my business in the future." 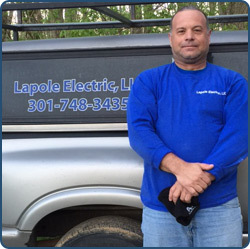 "I can't say enough great things about Lapole Electric. Gary and his crew are great. They have done work, both for myself and for my company, and have exceeded all expectations every time! Absolute professionals. Thanks, you guys are awesome!!" (C) 2014 Lapole Electric, LLC.